A rite of passage for many rural youth in southern Alberta, the Taber and District 4-H Show and Sale will be featured at the Taber Agri-Plex this upcoming Friday and Saturday. Various clubs from Taber, Retlaw, Hays, Grassy Lake and Vauxhall areas will be featuring beef, sheep and lamb submissions for the two days. For the beef projects, they have to be weighed in before Nov. 15. Calves are usually received at the end of October or the beginning of November with kids looking after the animals right until the show and sale in June. Sheep projects are usually received at the end of March or beginning of April. As kids from the various clubs vie for top marks from judges, Mills noted there are the usual benchmarks that are sought for those giving marks. Mills applauds the business community in the Taber and District Show and Sale, often drawing very favourable prices for the kids’ projects. 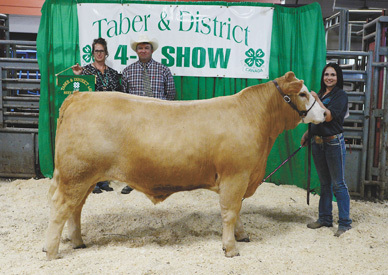 The heifer show starts at 11 a.m. on Friday at the Taber Agri-Plex. The parade of clubs goes at 1 p.m. with the steer show at 1:30 p.m. If the show goes in an orderly fashion, the grand champion is expected to be unveiled at approximately 3 p.m. The sheep show goes Saturday at 10 a.m. with the sale of market lambs and steers at 2 p.m.